Humankind is revealed as simultaneously insignificant and utterly dominant in the grand scheme of life on Earth. The new study is the first to estimate the total weight of every class of living creature. Plants and bacteria are the most abundant lifeforms on Earth, representing 82 and 13 percent of all biomass, respectively. All other creatures — from fungi to fish to all other animals — make up the remaining 5 percent of the world’s biomass. Farmed poultry today makes up 70% of all birds on the planet, with just 30% being wild, the study found. 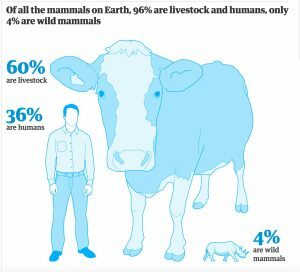 The picture is even more stark for mammals – 60% of all mammals on Earth are livestock, mostly cattle and pigs, 36% are human and just 4% are wild animals. The destruction of wild habitat for farming, logging and development has resulted in the start of what many scientists consider Earth’s 6th mass extinction. About half the Earth’s animals are thought to have been lost in the last 50 years. Despite humanity’s huge impact, we are dwarfed by other types of life in terms of weight. Viruses alone have a combined mass three times that of humans, as do worms. Fish are 12 times greater than people and fungi 200 times as large.